After the recent deaths of two black men (Michael Brown and Eric Gardner) who died while resisting lawful arrests by police officers, protesters were seen carrying signs stating “Black Lives Matter” at several different protests. Kathleen McCartney, the president of very liberal Smith College tried to show her genuine support and solidarity for the protesters in an college-wide email that stated in part “….we are united in our insistence that all lives matter.” Unfortunately for Ms. McCartney, the politically correct, leftist radicals objected and she was forced to issue an apology. Does she now agree with the radicals and race-baiters that all lives don’t matter? Is it just black lives that matter? Does she now believe in ‘Black Privilege’? Can anyone forget Al Sharpton’s “Million Marchers” protests against alleged police violence? The protesters were encouraged by Sharpton and his protest organizers to chant “What do we want?… Dead cops!” as they marched in New York City and other cities. So, at some point, the goal of the protests was changed from protesting the deaths of two black men to killing the police for revenge. Many protesters around the country used the chant “Hands Up – Don’t Shoot” to somehow indicate that Michael Brown was shot while his hands were up. It didn’t matter that Michael Brown just committed a strong-arm robbery, assaulted a man much smaller then himself and was attacking a police officer before he was shot. During the filming of some of the protests, TV news reporters asked some of the participants in these marches what was the meaning of the slogan “Hands Up – Don’t Shoot” and many didn’t know. Yes, the useful idiots were out there protesting, but they really didn’t know the facts of the cases they were protesting. They could just as easily have been told to yell out the slogan “Pants Up – Don’t Loot.” It really didn’t matter. All they knew was that they were protesting the murder of black men at the hands of white racist police officers. Again, the truth didn’t matter. 6 foot 5, 290 pound, Michael Brown who, with an accomplice, robbed a local convenience store, assaulted the clerk, stole some cigars and walked away. A short time, later they were stopped by a police officer. At some point, Brown assaulted the police officer and tried to take his gun causing the gun to be discharged in the police car. As Brown and his accomplice walked away, the police officer ordered them to stop. At some point Brown turned around and charged the officer. The officer, in fear of his life and of being overpowered by Mr. Brown, fatally shot Brown. Brown’s criminal accomplice made up a story that Brown was shot in the back while his hands were up. This was later disproved by forensic evidence and the testimony of many brave local black witnesses, but to the race-baiters, the truth didn’t matter. The facts didn’t matter in either case to the race-baiters. It didn’t matter what the decisions of the grand juries were, because the black President of the United States, the black Attorney General, long term black race-baiters Al Sharpton and Jesse Jackson, a dingy assortment of progressive Democrats, left-wing anti-police haters, Black Power groups, the NAACP, other race-baiters and many white radicals from a variety of America-hating, Marxist and communist organizations, including well-funded former Occupy Wall Street activist leaders, were going to insure that there were marches and riots anyway to show their solidarity against some imaginary endemic of racism by white police officers and by extension, by the entire white racist society. After all, the black president of the United States had said so. Really? Our race-baiting president lied once again. What realities was he talking about? Obama even met with Al Sharpton and other black leaders after the Missouri case and told them “to stay the course.” What the heck did that mean – was he telling them to keep on rioting? There is, of course, no proof that blacks are currently being treated differently under the law, but the truth never seems to matter to President Obama. He didn’t have to present any facts about actual injustice. All he had to do was give the perception that such injustice existed. The innuendo to be taken from the President’s remarks was that most white police officers in America are racists and that he and the federal government had to step in to solve the problem. By the way, he also added brown people and people of color into the mix in order to turn the problem into a national, police versus minority crisis. Can you guess who had the audacity to say such a thing? Was it some white conservative radio host who said it? Was it some liberal white professor ashamed of his or her so-called “white privilege”? No, the person who uttered these remarks was none other than Jesse Jackson, one of the chief race-baiters in America. Of course, Obama, Holder, Sharpton, Jackson, DeBlasio, et al., are not about to discuss the real reason young black males are more likely to be stopped and/or arrested for crimes. Unfortunately, black males are far more likely to assault police officers, commit crimes, particularly violent assaults and murders. Instead, these race-baiters insist the problem is institutionalized white racism. But are police officers (white or black) really racist? 1. Assault rate for the general public in the United States was 229 per 100,000 people. 2. Assault rate on police officers was 9,300 per 100,000 officers — a rate 41 times higher. … Considering the number of times police officers are victims of assaults by criminals, this data also suggests that police are not pro-actively looking for excuses to fire their weapons. The number of justifiable killings by police equals less than one percent of the assaults on police. Thus even when assaulted, police rarely resort to killing their attackers. 3. According to Bureau of Justice Statistics, the rate of black officers who kill black felons is 32 per 100,000 black officers, which is more than twice the rate of white officers who kill black felons — 14 per 100,000 white officers. The figures clearly show there is no racial component to the shootings by police officers. 2,245 black people were killed by other black people. The above statistics reveal that the biggest threat to a black person in the United States is from another black person, not from a white person or Hispanic person. Where is the outrage by white people over the 409 white people killed by black people, which is twice the number of black people killed by white people (including Hispanics)? It’s because there are very few if any white versions of Al Sharpton or Jesse Jackson urging their people to resort to violence. Ever hear of the concept of ‘Critical Race Theory’ that has been taught in our high schools and colleges for the past several years? It is the socialist, anti-white, racist indoctrination theory that teaches American students about “White Privilege.” It states that white racism in America exists on a very large scale; that it is permanent and it affects every aspect of our society. Therefore, black people and any other ‘persons of color’ have become permanent victims of a white, racist society and it purports to explain everything about minority victimization. Only it’s not just a theory any more: Today the teaching of ‘Critical Race Theory’ and ‘White Privilege’ has become a reality in public schools, churches, homes, black web sites, black journalism groups, in speeches of the race-baiters and, of course, on the streets in minority neighborhoods. It is no wonder some black people seem to have resentment and even hatred towards white people they don’t even know. That might be a reason the black-on-white, black-on-Asian, black-on-Hispanic “Knock-Out Game” is so popular among black young men. They are being taught to hate these other groups. What race-baiters like President Barack Obama, Attorney General Eric Holder, Al Sharpton, Jesse Jackson, Democrat party leaders and the mainstream media have in common is their desire to portray blacks and other so-called ‘people of color’ as permanent victims of a white, racist society. Permanent minority victimization is the standard to be used in the true politics of racism. The race-baiters must constantly remind blacks and other minorities they are being treated unfairly by whites and they need to support minority leaders and minority organizations in order to obtain social justice and level the playing field. The white radical professional Marxists and Communists have joined the fight. They are well-financed by George Soros and other socialist billionaires, well trained, professional agitators of Occupy Wall Street fame. The issue doesn’t matter to them. A couple of years ago it was the corporate ‘One Percenters.’ Today it is racist police officers. They are not looking to change the system for any particular issue or cause. They are looking to take control of it. On December 20th, two New York City Police officers, Rafael Ramos and Wenjian Liu, were shot and killed, execution style, by Ismaaiyl Abdullah Brinsley, a recent Muslim convert who undoubtedly had been influenced by the race-baiting words and actions of President Obama, Attorney General Holder, Al Sharpton, Jesse Jackson, the Black Congressional Caucus, certain black athletes, Mayor DeBlasio, the national media and a host of other so-called leaders using the death of two black men as cannon fodder for their personal political agendas. I was a member of the New York State Police for over thirty years, having spent the majority of my career in New York City working in a city-wide Narcotics unit, the Major Case Squad and the Violent Felony Warrant Squad. During that time, I had the honor to work very closely with members of the NYCPD in various units of the New York City Police Department, from the police officers walking beats, to the precinct sector cars, the Borough warrant squads, the Emergency Service Units and the elite Major Case Squad and always found them to be very professional and of the highest moral character. New York City is the toughest city in the nation to be a police officer in and the NYCPD officers are not paid nearly enough for putting their lives on the line every day to protect the people of the city. Contrary to what you are told by the race-baiters and the media, the people of New York City, of every color and ethnicity, are very supportive of their police officers as are the vast majority of Americans across this great country who support the police officers who protect them. In many cases, when the NY State Police – Violent Felony Warrant Squad unit was arresting a person wanted for a Murder or Armed Robbery and taking the defendant out of a building in a mostly minority neighborhood of New York City, the residents not only helped us locate the bad guy but on many occasions thanked us for being there and getting him out of the building. Oftentimes, the minority residents of these neighborhoods rarely venture out at night, because they are terrorized by local criminals, who too often are young black males. Police Officers have a very tough job. On any one day, he or she must be understanding, diplomatic, know first aid, be calm when others are excited, take control of situations when tempers flare, physically subdue criminals, comfort people suffering a loss and have a host of other positive attributes. Although people may not want to see a police officer when they glide through a stop sign, they will surely be glad to see one if someone is breaking into their apartment or threatening to assault them. Police Officers throughout the country are truly the last line of defense for their fellow Americans against the criminal element in our society as well as those political radical activists who seek anarchy in the streets. Police Officers take an oath to protect us from the bad guys and to protect and defend the people’s rights that are protected under the U.S. Constitution. It can be a thankless job. The newspapers, like in the Michael Brown and Eric Garner cases, sensationalize certain situations to sell papers and increase viewership, often ignoring the hundreds of thousands of heroic, life-saving and life-threatening acts police officers perform every day. Police Officers must make instant, life-or-death decisions every day in the course of performing their duties that are eventually reviewed by lawyers, judges, politician, reporters, political activists and arm-chair quarterbacks for the next months or years in the comfort and safety of their offices. Young men and women become police officers to help their fellow citizens, not to shoot anyone. During their career, police officers will come in contact with the best of people and many times, will also have to deal with the worst of people. They are a composite of what all men and women are in America. They are just like you and me. They are your brothers and sisters, your fathers and mothers, your relatives, your friends and your neighbors down the street. There is little doubt that the combined race-baiting words and actions of President Obama, Attorney General Holder, Al Sharpton, Jesse Jackson, Mayor DeBlasio, the national media and others directly led to the death of two New York City Police Officers at the hands of a black man who had been convinced by the race-baiters that police officers were the enemy of blacks. Race-baiting words and actions on the part of politicians, activists and other individuals that eventually lead to riots, injuries of non-participants and/or the violent death of one or more innocent people, including police officers, should be made a serious violent felony crime and those who practice this heinous, racist crime should be prosecuted. Words have consequences and the words these politicians and race-baiters used have most likely contributed to the death of two brave and honorable police officers in New York City. Yes, Mr. President and Mr. Holder, Sharpton, Jackson and DeBlasio – All lives matter, including the lives of police officers. 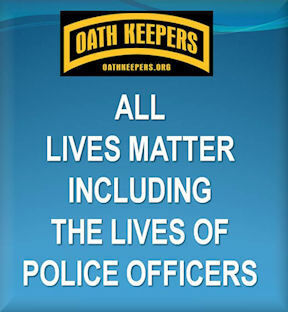 I am a member of a national organization called the Oath Keepers, which is an organization of active-duty and retired members of the military, veterans, police, fire and emergency service personnel who stand by our Oath to the Constitution. We stand shoulder to shoulder with our brothers and sisters who are honest and dedicated local Police Officers, State Troopers, Deputy Sheriffs and federal agents in this nation.